True Colorado living! This 4BR/2.5BA custom log home with 2.5 car garage was built in 2006 by a long-standing local contractor in maximizing privacy and views. The end-of-the road and up-top placement provides direct line of site to Dome Rock, numerous other unique rock formations, the Four Mile Creek valley and several outlying mountain ranges. Land area consists of two parcels totaling 38.3-acres (see attached maps). The smaller parcel is situated at the main entrance to the larger property and has been improved with a 36' x 48' shop building. The 12' x 14' overhead door will facilitate storage of the largest RV's with abundant left over space for storage, etc. An owner would have the option to keep the lot and metal shop building attached to the larger tract or sell the 2.3-acres (parcel no. 1387.201050140) to a third-party for a home site. 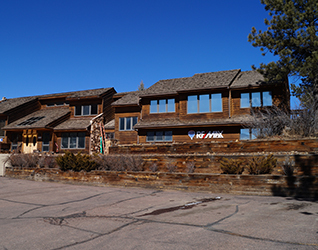 (Note-only the 2.3-acre parcel is located in Ranch Resorts and subject to covenants). Topography consists of various rock formations, native grass meadows and pine and aspen tree draws that serve to attract wildlife. The topography of the nearby Dome Rock W.M.A. supports one of Colorado's largest populations of big horn sheep, which are frequently viewed from the home. Elk, mule deer, whitetail, black bear, mountain lion and turkey are also common. Larger ranches adjacent north, south and east of the property have been placed in conservation and can not be developed. Nearby federal and state public land areas (Dome Rock Wildlife Mgmt Area, Mueller State Park and the Florissant Fossil Beds) provide for over 18,000 acres of sight seeing and recreational opportunities. Located just 25-minutes from the city of Woodland Park and one-hour from Colorado Springs, this is a must-see Colorado home providing one-of-a-kind views and privacy.